This Bathroom Kitchen Corner Rack is made up solid durable plastic and has high load-bearing capacity and holds up to 5 Kg with powerful adhesion system. 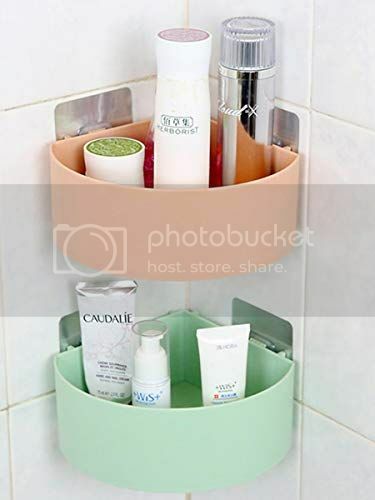 Use this as a shower caddy, kitchen rack, bathroom shelves racks etc. Turn any corner into elegant and useful storage and create any arrangement from one shelf to a complete shelving system. Perfect for office, living room, bed room, bath room and kitchen. 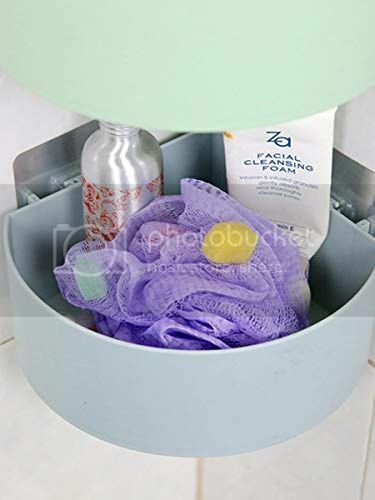 This kitchen bathroom storage shelves can be used to organize spice, shampoo, shower gel, Lotion, soap, razor, spice bottles, sauce and other kitchen and bathroom accessories for home. No Tools . No Screws. Hassle-Free Installation. No More Ugly Holes in Your Bathroom or Kitchen. Simply Choose a Smooth Surface such as tiles, glass, metal, plastics or painted wood. Apply it and You're done in No Time. DO : Press and Flat the sticker pad, squeeze the air out from middle to edge.Hang the Tray on the Sticker pad's hooks. 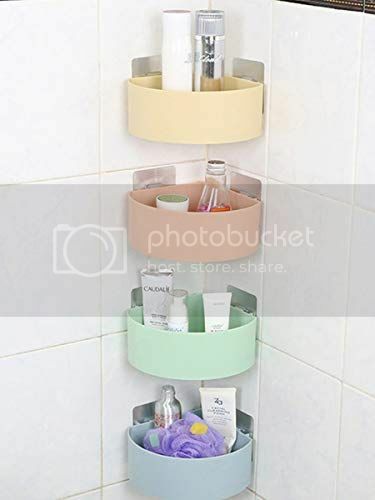 Triangular Shelf Rack comes in variety of colours and can be used in many ways.Keep products on it like face wash, shower gel, etc. The triangular corner shelf Pack of 3 is made of high quality plastic and you can place it anywhere without drilling as it comes with the sticker. The STICKER is an Innovative Formula that Grasps the Surface Firmly & Greatly Improves the Loading Ability and Service Life of Wall Mounted Accessories in Bathroom, Kitchens and Elsewhere in the Home, with No Damage to Your Walls. NEVER FALLS OFF from the Wall Once You Stick It. Sticker's Strong Adhesiveness Protects Against Water and Provides Extra Strength & Durability. * BENEFITS * ? Easy to Install on the wall. No Drilling, No Screws Required. Hence, Cost Effective and also Saves Time. High Load-Bearing Capacity and Holds up to 5KG. Strong Adhesive. NEVER FALLS OFF.* ? Multiple Uses. Versatile Holders. Organize Your Kitchen Sink Tools, Sponges, Scrubbers, Household Cleaning Supplies, Bathroom Accessories, Toiletries and even Your Cosmetics.